Imagine a ski-jumper, poised in mid-air, suddenly soaring off across the valley; or a high diver swooping to the surface of the water, and then up again. 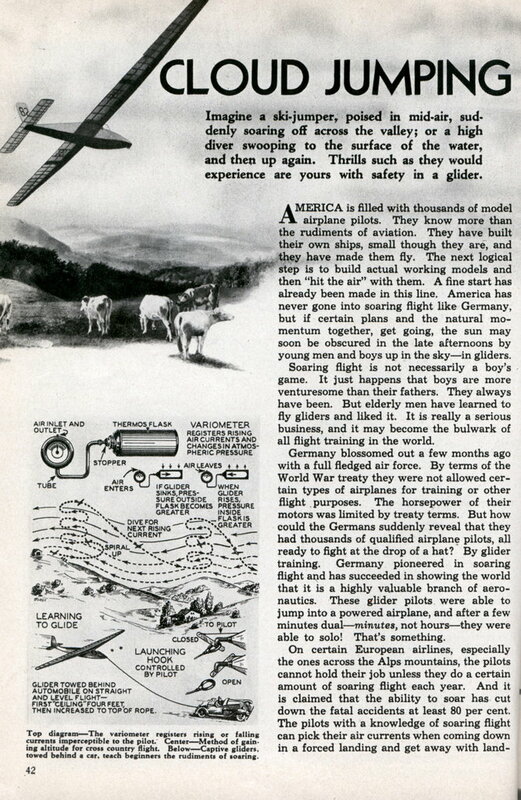 Thrills such as they would experience are yours with safety in a glider. AMERICA is filled with thousands of model airplane pilots. They know more than the rudiments of aviation. They have built their own ships, small though they are, and they have made them fly. The next logical step is to build actual working models and then “hit the air” with them. A fine start has already been made in this line. America has never gone into soaring flight like Germany, but if certain plans and the natural momentum together, get going, the sun may soon be obscured in the late afternoons by young men and boys up in the skyâ€”in gliders. Soaring flight is not necessarily a boy’s game. It just happens that boys are more venturesome than their fathers. They always have been. But elderly men have learned to fly gliders and liked it. It is really a serious business, and it may become the bulwark of all flight training in the world. Germany blossomed out a few months ago with a full fledged air force. By terms of the World War treaty they were not allowed certain types of airplanes for training or other flight purposes. The horsepower of their motors was limited by treaty terms. But how could the Germans suddenly reveal that they had thousands of qualified airplane pilots, all ready to fight at the drop of a hat? By glider training. Germany pioneered in soaring flight and has succeeded in showing the world that it is a highly valuable branch of aeronautics. These glider pilots were able to jump into a powered airplane, and after a few minutes dualâ€”minutes, not hoursâ€”they were able to solo! That’s something. On certain European airlines, especially the ones across the Alps mountains, the pilots cannot hold their job unless they do a certain amount of soaring flight each year. And it is claimed that the ability to soar has cut down the fatal accidents at least 80 per cent. The pilots with a knowledge of soaring flight can pick their air currents when coming down in a forced landing and get away with landings where straight power pilots would crack up. There is no better way of learning practical meteorology than in soaring flight. Most of the present information now used in scientific weather forecasting was gained through soaring flight in the northern European countries. It is estimated that every pilot would be about 50 per cent safer if he were a soaring expert. All sorts of theories, medical tests and gadgets have been rigged up at military flying schools to help choose the natural flyers, but none have been much good. Many a man could work the gadgets and stand on one foot without a quaver of a muscle, and flying instructors would believe he could become an ace of aces; but later, when put to a practical test on landings and turns, he would be a “wash-out.” But no graduate of a good soaring school has ever failed to learn to fly a powered airplane. Many of them, naturally, might not become good military pilots, but they could go from “here to yonder” safely in a powered airplane. Everybody cannot learn to fly gliders. Many a person is unable to get the hang of making turns and landings and sensing the wind currents. It has been found that among groups of 30 normal people between the ages of 14 and 40, about two of them cannot learn to fly gliders well enough to be turned loose. Some people get terribly frightened after leaving the ground. But two people out of 30 is a ratio of the normal number of people who probably should not be allowed to drive automobiles. Every automobile driver of experience knows that at least two or three people out of 30 on the highways are absolutely dangerous drivers. These are the slow, wobbly people who can’t make up their minds on what to do. They are the same people who can’t learn to fly gliders and airplanes. A number of airplane pilots, especially cadets just learning to fly are ground shy. This is because they get panicky when they come down close to the ground and see how fast they are traveling. In other words, their flight training has been backwards and has not been “natural.” A person learning to drive an automobile becomes greatly excited the first few times the car picks up speed greater than 30 miles an hour, when he is operating it. The “natural way” a person becomes a glider pilot is as follows: After learning to guide a glider straight and level behind an automobile with rudder and ailerons at about 20 miles per hour, and at a “ceiling” of not over four feet, the speed of the automobile is increased, and the student allowed to pull back the stick and sail on up to the top of the rope. After he gets good at this, he is allowed to unhook the glider from the rope and glide down. After learning to glide straight, the novice is allowed to make a gentle turn. From this point on turns are practiced. After the student has mastered this glider, he graduates to a regular sailplane. These are not toys; they are the real flying article. They are machines in which a fellow can stay up in the air for hours, and travel more than two hundred miles, if he can get the right wind conditions. The sailplane stage may take five or ten hours to reach average proficiency. In this stage, the student is shown where and why the various air currents may be found. He is shown where he can strike upward currents and gain altitude and where the best areas may be found for steady flight. The cost of gliding and soaring courses are usually very reasonable. In clubs, $50.00 a student may cover the whole course. Thus a person can come to within a few minutes, or an hour or so at most, to soloing a powered airplane for about $50.00. When the ingenuity of the American youth turns to soaring flight, experts predict that revolutionary types of sailplanes may appear. Some boy may discover the secret of the sea gull’s flight, or discover the best kind of wings to use. No wing made by man has been able to do the things that birds do with theirsâ€” in the problem of safety. But now that the thousands of young model builders in America are all poised to take the next step “upward” by the soaring route, big things are in store for the future. It is always putting things in perspective to read the history of all the aviation in the eyes of the old newspaper I just can’t imagine myself reading them all to find the anecdotes that you do. 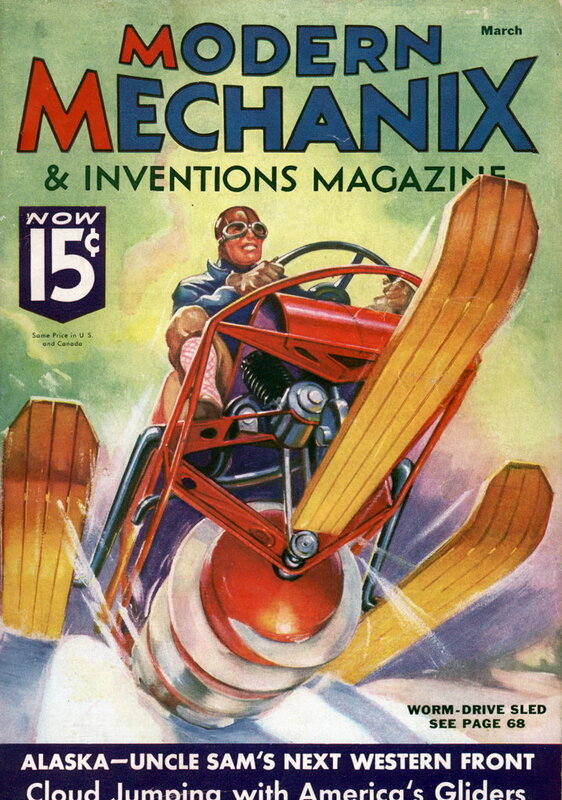 Just kidding it is another article from the Modern Mechanix that bring the hottest news in aviation for 1936!